The EWB challenge, supported by the Engineering Council and the Engineering Professors' Council, has been designed to give first year university students an opportunity to design creative solutions to real world community development problems. The challenge also encourages students to learn more about design, and helps them to further develop teamwork and communication skills. 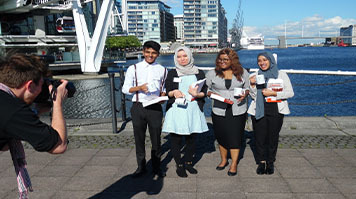 LSBU’s Samantha Page, Zahra Rezaye, Aisha Salim and Mohib Muhammad, students on the BEng Chemical and Process Engineering course, secured their place in the finals and won the first ever People’s Prize award for their prototype ‘Bamdrawer Filter’. Created from locally available materials and resources, it has been designed to tackle the problem of water filtration and sanitation faced by the local community in Bambui, Cameroon. The design integrates a filtration drawer mechanism with a Moringa seed incubation chamber, the result is an economically viable, easy to maintain and affordable water filter system for people in the community. LSBU’s Adou Kacou, Ahmad Rizwan, Benard Ogoegbunham and Michael Berry, students on the BEng Electrical and Electronic Engineering course, were also shortlisted for the EWB Challenge final for their Compressed Earth Block design. The Blocks are made from earth that has been compressed to the point that it becomes rock-hard. The students found research to support the fact that the compressed earth had become as strong as cement and, through the block shape, the design could be used to construct channels for water flow and structures for buildings. The block design also incorporates societal benefits by allowing the entire Bambui community, even children, to safely engage in simple construction projects. The EWB Challenge 2016 was developed in conjunction with Reignite and gave more than 4,600 engineering students an incredible opportunity to engage with practical community development in Bambui, Cameroon. Fittingly held at one of the most sustainable buildings in the world, the Crystal in London, the largest ever EWB Challenge hosted 36 teams from 26 Universities from the UK and Ireland. The students pitched their ideas to a panel of independent judges, including President of the Engineering Professors’ Council, Professor Stephanie Haywood, and Director for the Department of Energy and Climate Change, Alastair Grainger. Alessio Corso, LSBU’s Senior Lecturer at LSBU’s School of Engineering, said: “To see both LSBU groups make it to the final 6 was fantastic, and is testament to our students’ work ethic. I am so proud of them. “Engineering programmes at LSBU place emphasis on broad thinking and challenge students to use broader skillsets. We encourage students to use creativity tools and to understand environmental, economic and social contexts when making decisions to ensure that solutions are resourceful and innovative. Most importantly, we teach our students that they are more than just another Engineering solution. Dan Craddock, Education Projects Manager at Engineers Without Borders UK, added: “The EWB Challenge is allowing students to work on real life, complex problems in the classroom and enabling them to understand context and how it affects design decisions in engineering. The skills students are learning whilst participating in the EWB Challenge are essential for their future careers and in becoming globally responsible engineers.